John Kaytaz has created a formula infused with wheat protein that pumps up hair for maximum volume. Preps hair for JKS body plus conditioner. Suitable for all hair types. 03 Pure & Sensitive Shampoo - 8 oz. John Kaytaz has created a vitamin enriched formula that features the Amazonian anti-oxidant ACAI BERRY, and is extra sensitive to your hair and skin. 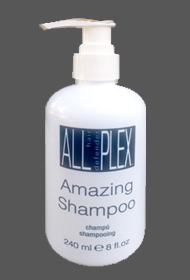 Ph Balanced to create an ultra-mild shampoo for daily use. No fragrance added. 05 Color Conscious Shampoo - 8 oz. John Kaytaz has created a vitamin enriched formula for all types of color treated hair. Leaves hair feeling nourished, smooth, and manageable, while helping to prevent color from fading. 07 Crisp & Mild Shampoo - 8 oz. John Kaytaz has created a crisp formula that gently cleanses all hair types leaving hair managable and ready to style. John Kaytaz has created a crisp formula that gently cleanses all hair types. 09 Repair Shampoo - 8 oz. John Kaytaz has created a vitamin enriched formula that infuses natural oils to improve the hair beyond belief. Suitable for extremely stressed or damaged hair, also recomended for color treated hair to seal in moisture & protect cuticle. 11 Wave & Curl Shampoo - 8 oz. John Kaytaz has created a vitamin enriched formula for curly, wavy, or permed hair that seals the cuticle to prevent frizz and define curl. 12 Shampoo For Men - 8 oz. John Kaytaz has created a vitamin enriched formula designed specifically for a man. This deep cleaning product is infused with the invigorating effects of tea tree oil that adds thickness and strengthens the hair shaft, niacin for opening clogged pores, and biotin which restores nutrition to follicle for growth. 27 Bombshell Blonde Shampoo - 8 oz. John Kaytaz has created a formula for blondes that want to maintain their bombshell image. It also neutralizes brassy, unwanted tones. 42 Rocket Red Shampoo - 8 oz. John Kaytaz has created a formula for red heads that want to maintain their rocket image. It also neutralizes unwanted tones. 44 Brazen Brunette Shampoo - 8 oz. John Kaytaz has created a formula for brunettes that want to maintain their brazen image. It also neutralizes brassy, unwanted tones. JKS All hair defender Plex is based on a new and exclusive molecular technology composed of a blend of active molecules. JKS Amazing Shampoo is a perfectly formulated cleanser to assist in maintaining strong and healthy hair. Scalp Rehab Shampoo - 8 oz. John Kaytaz has created a vitamin enriched formula designed especially for thinning hair. This cleansing product uses niacin for opening clogged pores, biotin for restoring nutrition to the follicle, and tea tree oil for healthy scalp circulation. 3 exotic herbs and selective scents that will leave you totally relaxed and maybe infatuated. Also can be used as sensual body wash.